I have a birth story post brewing, but that has been put on hold by the demands of a newborn and the fog that still resides in my head. Birth and its aftermath was fairly routine. 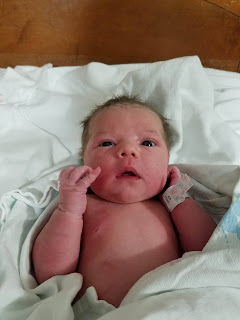 In fact from a pain perspective, this delivery has been probably the easiest I have had. I finally found a pain medicine protocol that works for me; it only took five times. I had minor tearing and, I think, two stitches that healed very quickly. I was sore for a few days, but overall the aches and pains associated with post-pregnancy has been mild. If only that was the end of it. During the pregnancy, I continued with my low blood pressure that I have always had. Normal readings for me stay around 100/70 and 90/60 is not alarming. I had an annoying high pulse, but was told repeatedly it wasn't high enough to be worrisome. It just pounded in the 90s most of the time. Within a day after delivery, my pulse blessedly returned to normal. Within five days of delivery, I had a continuous low grade headache. I first attributed the headache to too much screen scrolling while sitting with a baby. I was still basking in my non-pounding pulse. After several days of this dull headache, I decided to take my pulse to see where it was sitting. I was expecting something in the mid-70s. I got something in the mid-50s. Huh. That's weird. I immediately wondered what my blood pressure might be with such a pulse, and being the proud owner of a cuff, I went to find out. I had no idea what to expect. 135/85. What? That was somewhat alarming. Over the next few days, I kept a steady eye on my blood pressure. While not technically actionable, it was a lot higher than my usual and my head was dull. I even had a migraine aura. Over the course of a few days, it stayed in that same range, and after I stupidly spent two hours in an unair-conditioned barn for a wedding reception, it got as high as 150/90. Officially concerning. I consulted my doctor and started keeping a regular record. That high reading was as high as it got. Over the last week it has stabilized into a more normal range with my high readings being 120/80 and the others hanging around 110/75. So maybe I am not going to have a stroke. My pulse has not recovered as nicely. It is still hovers in the 60s or 70s during the day and I am sure falls into the 50s (or 40s) while I sleep. This slow circulation does not help the dull headache. My brain is foggy and slow. I have to reach for words. And! I am getting heart palpitations. I think I have figured out they are exacerbated by stress, low blood sugar, and the slow pulse. The palpitations are much fewer when I keep my blood sugar level. However, regular eating is not my strong suit. Regular eating with a newborn is really not my strong suit. The fun thing about heart issues is that thinking about them can cause your body to react. I wonder about my pulse and can watch it slow down noticeably on the monitor. I think about a palpitation and then my heart starts flip-flopping. I have to keep up with what's happening while at the same time not dwell on it and make it worse. I have an appointment on Monday for vitals and bloodwork to make sure all this is on the side of annoying, but harmless postpartum complications and not something more ominous. In my saner moments, I feel confident all this falls under annoying but harmless, but this hasn't been enjoyable either. Half the time I wonder if I shall have a stroke or if my heart is just going to quit beating. Eleanor Clare was born on Tuesday, September 12th at 3:40pm. She weighed 7lb 4oz and was 18.5 inches long. We are going to call her Ella. Labor was not precipitous. Weird. We are both doing well. This has been one of my easier recoveries even though I have sluggishly done nothing for months *and* I'm officially old and all. Baby is back up to her birth weight. I think? She has an appointment tomorrow so I'll find out for sure. I have the most ridiculous things happen to me sometimes and this is too ridiculous not to share. Earlier in the summer, a couple of people from the women's group at church approached me and said they would like to throw me a baby shower. This was a pleasant surprise, even though I don't need that much, and they decided to theme the party for diapers and wipes. (Although now I have discovered I actually need a new playpen. Ain't that the way of things.) 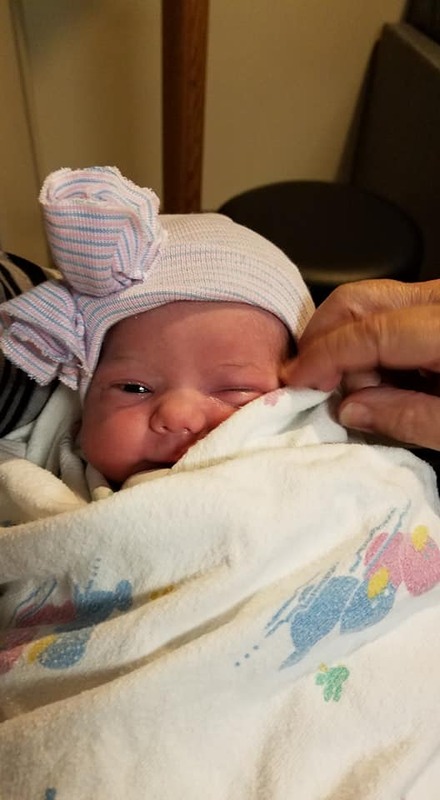 I have some baby shower trauma, which I alluded to back in this old post, but there is more to that story than is in the post. Let's just say that the experience of someone calling me to arrange a baby shower for me is not one I've had before now. Initially, we set the date for the shower for a Saturday in August and for scheduling conflict reasons that are not entirely clear to me, it had to be cancelled. I wasn't upset. They told me they would reschedule later and it might not be until after the baby was born. Totally fine. Now several weeks have passed. My family is involved in a homeschool book club that meets a couple of times a month for the children to talk about a book and run around like crazy people. Several of the families in book club also attend my parish. Yesterday was book club day. One of the mothers at book club asked me about the pregnancy and my upcoming induction on Sept 12th. ** I gave her the details and she looked at me, perplexed. She shared with me that she had received an evite to my baby shower just that morning. It is scheduled for Sept 16th. I blinked at her. She quickly realized I had no idea what she was talking about and started apologizing, thinking she had ruined a surprise. I explained it wasn't a surprise but had been cancelled back in August and that cancellation is the last I had heard about anything. I went home, bewildered. Waiting on me at home was a message on the answering machine. It was the woman from church organizing the baby shower. She explained that they were having a hard time finding a date without conflicts so they scheduled it for Sept 16th. She also realized it was around my due date so maybe I would be bringing the baby to the party. "Call me back..."
My mouth was now hanging open. They sent out invitations without ever asking me if I was available. They sent out invitations before even calling me to let me know they set a date without asking if I was available. I am now faced with making a phone call to tell this very nice, but apparently clueless, woman that no, sadly I, with my fashionable adult diapers, will not be bringing my 3-4 day old baby to a party full of germy, old women approximately 24 hours after being released from a hospital stay that was necessitated by the fact I had to push said baby's head out of my nether regions. ARE THEY OUT OF THEIR EVER-LOVIN' MINDS?!? **I have an induction scheduled for next Tuesday, Sept 12th, in order to control for my old friend, precipitous labor, and avoid the dreaded interstate delivery. I will be about 39.5 weeks and probably 5-6cm dilated at that point.